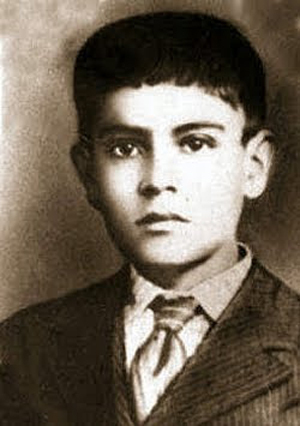 José Sánchez del Rio was born on 28 March 1913 Sahuayo, Michoacán, Mexico. Wanting to defend the faith and rights of Catholics, he followed in the footsteps of his two older brothers and asked his mother for permission to join the Cristeros. She objected telling him that he was too young. “Mama”, he replied, “do not let me lose the opportunity to gain Heaven so easily and so soon”. On 5 February 1928 the young boy was captured during a battle and imprisoned in the church sacristy. In order to terrorize him, soldiers made him watch hanging of one of the other captured Cristeros. But José encouraged the man, saying, “You will be Heaven before me. Prepare a place for me. Tell Christ the King I shall be with him soon”. In prison, he prayed the Rosary and sang songs faith. He wrote a beautiful letter to his mother telling her that he was resigned to do God’s will. José’s father attempted to ransom his son, but was unable raise the money in time. On 10 February 1928 the teenager was brutally tortured and the skin of the soles of his feet was sheered off; he was then forced to walk on salt, followed walking through the town to the cemetery. The young boy screamed with pain but would not give in. At times the soldiers stopped him and said, “If you shout, ‘Death to Christ the King’, we will spare your life”. But he answered: “Long live Christ the King, Long live Our Lady of Guadalupe!”. Once he arrived at the cemetery, José was asked once more if he would deny his faith. The 14 year old shouted out: “VIVA CRISTO REY!“, and was summarily shot.